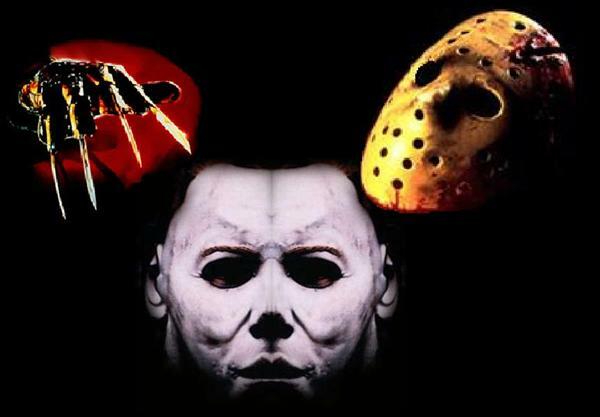 OK so I cheated and made #5 a three-way tie of slashers, but I always group these villains into the same category, the original Slashers. The Friday series is so much fun to watch with a lot of Cheese involved but some truly scary moments especially early on. The first two films are what make Voorhees really shine In my opinion, forget the hockey mask, the bag over the head was far scarier! Kruger is the king of cheese but he had the power to hunt you in your dreams, as a kid that scared the hell outta me, and his back story was really creepy, the pedafile that was murdered and now hunts the children of Elm street to take vengeance upon their parents! Of course Michael Meyers is epic, from the mind of Mustaffa Akad, the most succesful low-budget movie of all time until Blair Witch took that title. The Halloween series gave birth to Jamie Lee Curtis and had the creepiest theme music ever! Love these three guys and had to put them on the list. The shark had to make the list, he still scares people from going into the water, ask my brother-in-law. 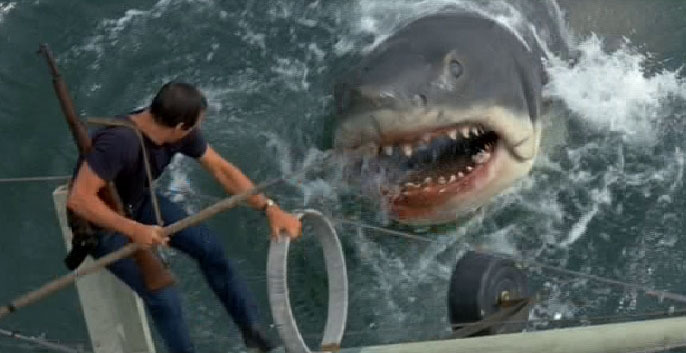 The absence of him from on-screen for most of the film made the shark even scarier, couple that with top-notch performances from Richard Dreyfuss, Roy Shieder, and my favorite Robert Shaw (See the original Taking of Phelam 123) and you have an instant classic! I loved going to Universal Studios just for the Jaws sequence! The sequels lost a lot of the luster the first one had as technology actually hindered the scares in my opinion. The opening scene is still one of the scariest beginnings to any movie, the girl skinny dipping solo and is overtaken by Jaws, it still holds up and for those reasons the shark makes my list at number 4! Bill skins fifth! 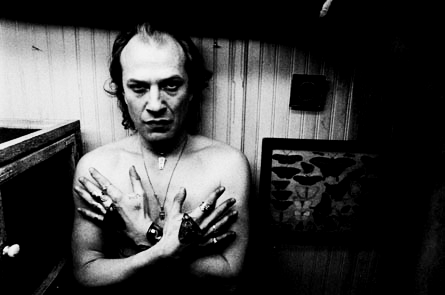 While Anthony Hopkins is remembered as the creepy one, and Jody Foster was the clever detective, in my opinion the scary one was Ted Levine as Buffalo Bill! The cross dressing, women skinning, psychopath that lured women with the sympathy of his broken arm and inability to load a heavy object into his van! The moth raiser was so epic that his line “It rubs the lotion on its skin or else it gets the hose again” has become part of pop culture and still send shivers up my spine! The ending sequence has such a taut feeling that it is almost unwatchable by those who are faint of heart. Bill easily is a top 3! I’m talking the original Tobe Hooper masterpiece here. When they started shooting this low-budget film, Hooper himself didn’t realize what they were putting together, he was going for a funny, goofy horror movie, but instead put together one of the most horrific film of all time as well as creating an Icon in Leatherface. The second character on my list that wears other people’s skin as clothing (there is something inherently wrong about that) Leatherface is just a part of the most F’ed up family in movie history! The dinner scene is so tough to watch, not because its bad, but because it is so uncomfortable and evil. The screaming in this movie becomes hard to bear and some of the scenes involving Leatherface are so burned into my brain he had to make number two on my list. The scene where we are introduced to Leatherface still stands as one of my favorites of all time, when he clubs that dude with the mallet and drags him into the house then slams that sliding door, the sound, the imagery, it all culminates into one of the finest shots in my memory! So the best bad guy in history isn’t a person, its more an entity an on-screen presence, it’s the genius of Kubrick portrayed threw The Overlook Hotel, the madness of Jack Nicholson, the ghosts, and just the overall madness that occurs within this film. From the opening sequence Kubrick bombards us with imagery, music and uncomfortable ideas. 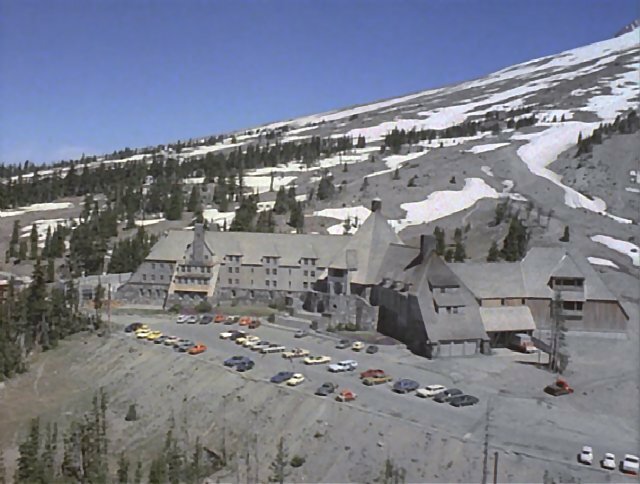 From Danny’s friend Tony, and the “Shining” Mr Holleran to the sheer awkwardness that is Shelly Duvall, to the downright evil that Jack becomes this film stands as my favorite Horror film of all time. Nothing is explained, and that’s just fine by me, it opened the doors for so much debate that here we are 40 years later and people are still arguing about what happens on the screen. Is the film about the plight of the Native Americans in history? Could it be Kubrick is revealing to us that he filmed the moon landing! Or could it just be about a man going mad from cabin fever, and attempting to murder hs family… or all three plus some more! That’s the beauty of this film, nobody knows, and now that Stanley has passed, we will never know. That aside, some things are not arguable, this movie is disturbing and scary, the twins give me chills in every seen that they appear, Jack Torrence has a dominating screen presence that is absolutely horrific and lets not forget all the strange little things that Kubrick put in to mess with out heads… For instance in every scene that a person appears, a chair is moved for each person during cuts, Why? Then the typewriter, at the start of the film it is white, then it becomes a dark grey! 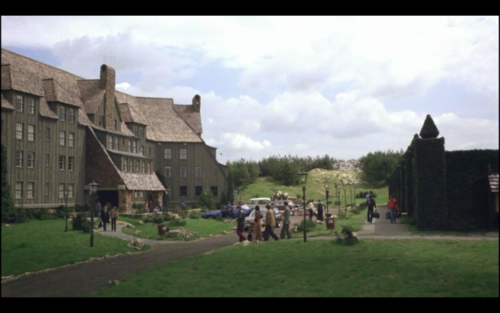 Then the maze, it’s not in any shots of the hotel at the beginning, it just appears once the family is there! The final scene with Jack in the picture has so many explanations and yet nothing is concrete. The hotel itself is filled with impossible hallways and rooms, for example Ullmans office has a window to the outside behind the hotel managers desk, but Wendy walks behind the office later in the film and down a hallway… The hotel itself is an impossible maze! For these and many more reasons, Kubricks hotel makes number one on my list and number one in my heart and mind! NOW THERE IS A MAZE!